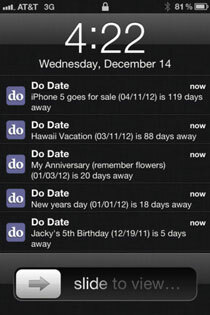 Do Date is a date calculator and reminder app that posts daily notifications of important upcoming dates and events to your iPhone’s lock screen and notification center. If you don’t want to receive reminders in your lock screen or notification center, you can easily enable/disable all or individual reminders in the app. 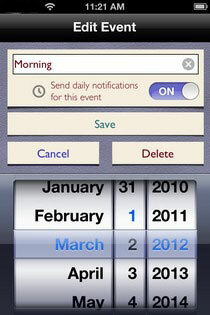 By default, reminders are sent at midnight, but the time can also be set by the user. 1. To create Events , you need to go to the Add Date section, and specify the name of the reminder in the text box given at the top of he screen. If it isn’t already on, toggle on the notification button, as that is the whole purpose of the app. 2. 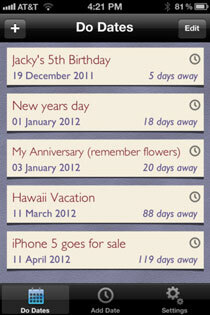 Once you have done all that, the next step is to set the date of the event, and then hit the Save button. 3. This will add the event to the Do Dates section of the app. You can make changes to, or delete, any event from the homepage using the Edit button. The app is available as a free download in the App Store, and you can grab it from the link given below.